Yesterday I posted the season-long non-conference record. Today I regurgitated another stat I decided to track for some reason: Heaves! I defined a heave as any shot from half-court and beyond since these shots mostly happen at the end of a quarter, and since they are low-percentage shots it’s not surprising to see a player be too cool and take one justttt after the horn sounds or take no shot at all. Whatever. I’ll address this later. There hasn’t been a post here about those numbers since early December, though, back when the league recorded only one made heave and was approaching the least-accurate season in the fifteen tracked seasons on Basketball-Reference. Those missed shots were a really big deal! Well, not really, but made shots are pretty entertaining and good Vine or YouTube fodder, except they just weren’t happening. Well, after starting one-for-94, the league gave us life. Over the last four months and change, they were 10-for-322 and Zach Randolph became the only player to make two heaves this season. Overall, heaves in 2015 finished with very average accuracy — a whopping 2.6 percent — and an attempt total that fit right in with previous seasons. Below is an updated look from shots from a distance of 45 feet or longer. I gave a two-foot cushion because there were conflicting measurements with Casper Ware‘s record-breaking heave last season. If you looked at the post from early December, John Henson was the only player to make a half-court shot back then. He’s not listed here anymore. Not sure what happened on Basketball-Reference. He doesn’t even have a three-point attempt this season. TANGENT: I also included the difference in three-point percentage because it took less than a minute to calculate it for all those players. Why did it take so fast? Because it’s 2015. We aren’t in the stone age anymore, when field goal percentage was looked at as a reliable way to measure shooting accuracy. Sure, missed shots from beyond half court shouldn’t count in the first place (they don’t in college), but in 2015 it’s not a big deal either way when it takes only seconds to filter them out and get a better look at a player’s shooting touch. You can do this easily because the heave totals are on any player page on Basketball-Reference or NBA.com like every other shot from a specific distance or zone. Look up any shot chart on NBA.com and it’s not just a bunch of dots with one single field goal percentage — they’re divided into several zones. We can even look at shots off the dribble, off a pass, and many other situations. This isn’t the early-2000s, which is why it’s insulting to everybody involved when a player sees a half-court shot as harmful, as if we weren’t smart enough to account for their missed heaves and place them in their own group of attempts like we do with every other shot. We would all take notice if somebody like Stephen Curry decided to take 20 or more of them in a season, filtering them out from the rest of his threes like we’ve done with players who attempt threes most often from the corner and only occasionally take threes from above the break like Tony Parker and Shawn Marion. 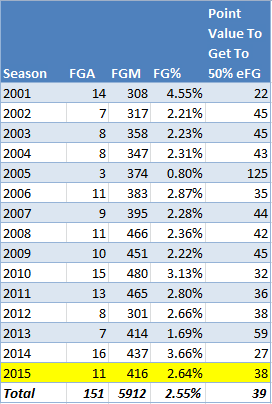 Knowing who might be a great three-point shooter from around the arc versus only the corners might not be the greatest example, but the bottom line is that it’s okay to take the end of quarter shot the other team can’t rebound because there are so many ways we can all look at shooting besides staring blankly at field goal and three-point attempts and percentages. Heaves are a win-win for the player and the team involved, though they do impact offensive efficiency. More on that in a bit. There was a time when I took the side of a player padding their stats by being too cool to take heaves, but that’s in the past. It is now a lazy take, and I hate everybody who thinks otherwise. Just kidding about that second part, but in my opinion it is a lazy take in 2015. 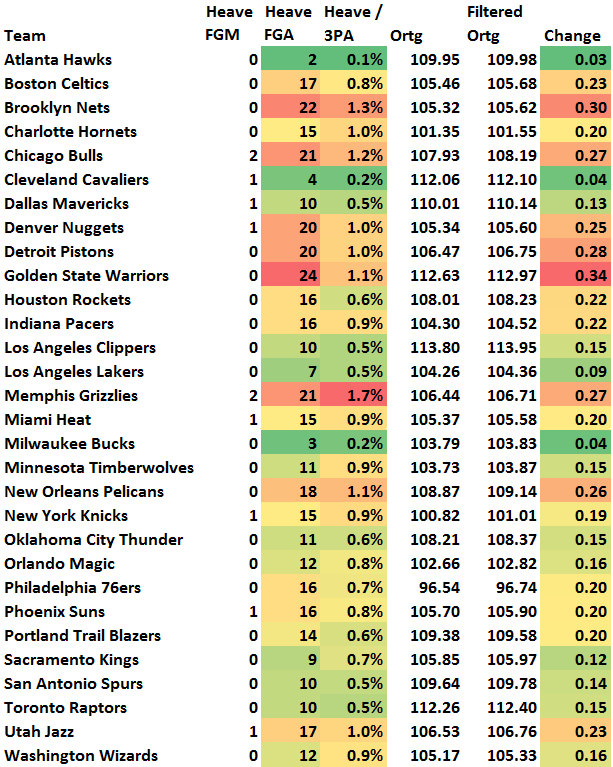 A little similar to when I looked at technical fouls and their effect on offensive and defensive efficiency, the change when filtering out heaves is not huge, but we’re still moving around the rankings slightly. With about 17 points between first and last place in offensive efficiency, a 0.1-0.3-point boost isn’t…not…meaningful. I’m also not sure the heave totals both for teams and league totals each season mean much. Less attempts could mean more 2-for-1 opportunities, or more attempts could mean that teams are willing to get off some kind of look with only a few seconds left in a quarter. Who knows? Something that might help with that would be a new play-by-play option: Player X (or Team X) runs the clock out. Maybe it’s only used for the first three quarters since the fourth quarter is a very different situation. There’s also sometimes an awkward, multiple-second gap between the final shot and the end of a quarter, so maybe the extra play-by-play option isn’t a totally ridiculous suggestion. Oh well, but maybe it could help show when there were heave opportunities and show who isn’t taking advantage of what is a win-win situation for everybody involved, save for fantasy basketball owners and gamblers.